Jolt spearmint caffeine-energy gum has a mild, natural mint flavor that perks you up and freshens your breath. Wow! Multi-tasking gum! Why would you settle for a single function gum? 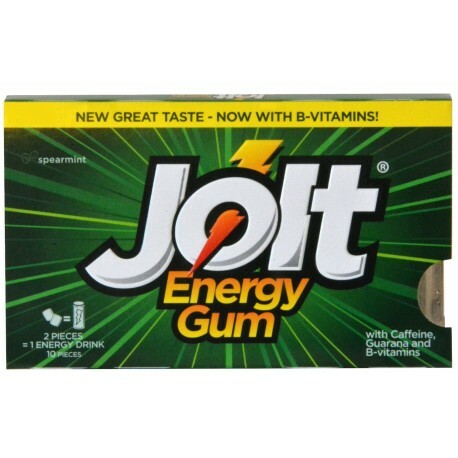 Jolt gum comes in a blister pack, so each piece is sealed until you’re ready for it. This gum is available at most AM/PM gas stations, it is $1.79 a pack. again most AM/PM stations should have them, not all. this gum has a very good spearmint flavor to it, it is very tasty but after a while like all gum starts to taste bad. the price for the gum is a very reasonable price. you get six cups of coffee in every pack. wow, a whole pack will give you a pretty good buzz. i have already had a whole pack today, and i am pretty wired.